Camplify is the fastest growing RV hire community in the UK. 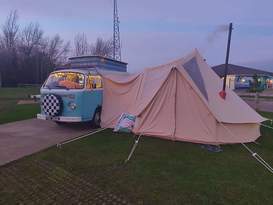 We connect local owners of static caravans, touring caravans, campervans, motorhomes and trailer tents with holidaymakers seeking to experience the joys of camping throughout Northern Ireland. Northern Ireland may seem small in comparison to the UK but there’s actually a surprising 5,460 square miles for you to discover and explore on your holiday. Easily accessible by ferry or airplane from the UK, it's a popular destination for those seeking beautiful landscapes and scenery to compliment a multitude of activities on a break away from the everyday. There’s 334 miles of coastline which convey vast golden beaches, quaint coastal towns and trails all steeped in history for you to encounter. There’s just as many adventures for those that want to be as active as possible to those that want to relax on their well-deserved holiday. So if you just want to sit back with a guinness and watch the Irish dancing, you can! Amongst the many iconic sights you may want to feast upon are the famous Giant's Causeway with walking routes all along the Causeway Coast and Titanic Belfast, a visitor attraction built on the site where the HMS Titanic was made. Foodies will love St George’s Market in Belfast where you can try all the local delicacies all sourced from around the area and the added beauty is that everything you’ll want to see or do is in within reach of your chosen holiday park or campsite. If you’re a fan of Game Of Throne’s, you won’t be surprised to learn that much of the series was filmed in the stunning locations across Northern Ireland such as Tollymore Forest Park in County Down and Shanes Castle in County Antrim. It really has everything for those seeking to escape and immerse themselves in a place that’s full of so much history around every corner. You can experience Northern Ireland and all it’s allure by hiring an RV through Camplify. 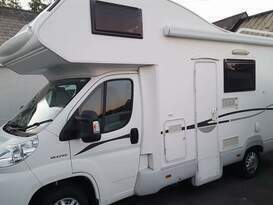 All you need to do is find the RV you want to spend your holiday in and either drive or tow it to your destination or destinations, if you plan on doing a little travelling whilst you’re there. You could even ask the owner to drop it off at the location if that’s what you’d prefer. Or if you’re staying in a static caravan or lodge at a holiday park in Northern Ireland then all you need to do is get yourself there and enjoy! 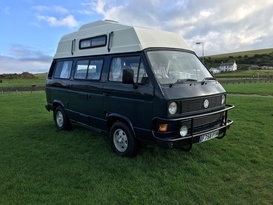 Here's some of our featured vans for Northern Ireland. We have many more! Head over to our Search page to find the perfect caravan or motorhome for your holiday.